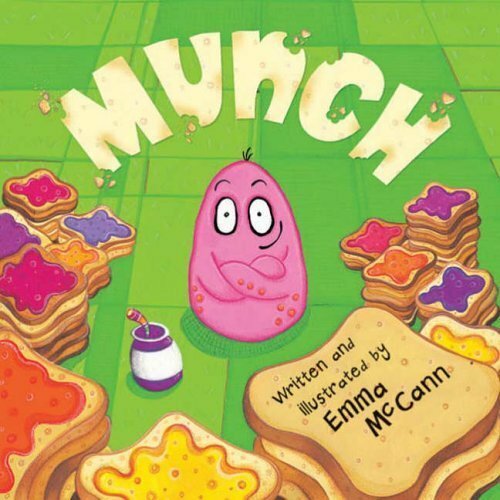 Munch is a little monster with a very big appetite. He eats 17 slices of toast with banana jam for breakfast and 11 slices of toast with broccoli jam for dinner. One morning, as he is enjoying his huge breakfast, the newspaper headline catches his eye: A GIANT MONSTER GOES ON A RAVENOUS RAMPAGE! Munch decides to stay home and protect his house. All is well until Munch notices that his precious toaster has disappeared. Munch storms out the house and confronts the enormous monster face-to-face. What happens next will surprise you! The book reminds us to never underestimate anyone based on their size. The book, Munch, is very useful for teaching concepts of time (e.g. day, night, morning, evening, yesterday) and size. There are many synonyms used throughout the book for big (e.g. giant, gigantic, enormous) and kids can come up with even more synonyms to describe the huge monster. 'Where' questions are modelled a couple of times in the text and the illustrations help children to have a go at guessing where the missing items used to be in the kitchen.